Definition: The Constitutional Convention, also known as the Philadelphia Convention, was a political conference held in Philadelphia between May 25, 1787 and September 17, 1787. The Constitutional Convention was attended by state representatives from each of the former Colonies, except Rhode Island, who collectively framed the constitution of the United States. Summary: The delegates of the Constitutional Convention framed the Constitution of the United States as a basis of government to address the weaknesses of the Articles of Confederation. The delegates agreed the new system of government would consist of Legislative, Executive, and Judiciary branches regulated by controls referred to as Checks and Balances. To obtain agreement to the constitution three major compromises were made on the subjects of Representation, Apportionment and the Slave Trade and the Bill of Rights were added as later amendments. Why was the Constitutional Convention held? What was its Purpose and its Goals? The original purpose of the Philadelphia Convention (Constitutional Convention) was to revise the Articles of Confederation. However the goal of many of the delegates who attended the Constitutional Convention was to create a new government, rather than fixing the existing system. This was believed necessary to prevent the 13 original states fighting one another and the break up of the union. In the end the Philadelphia Convention created the United States Constitution and the conference became known in history as the Constitutional Convention. When was the Constitutional Convention held? The Constitutional Convention was held between May 25, 1787 and September 17, 1787, a total of 114 days. Where was the Constitutional Convention held? The Constitutional Convention was held Pennsylvania State House in Philadelphia, Pennsylvania. The building, which is now known as Independence Hall, had previously seen the drafting of the Declaration of Independence and the signing of the Articles of Confederation. The Constitutional Convention was attended by delegates representing every state, except Rhode Island because it was fearful of losing its states' rights. The original states, except Rhode Island, collectively appointed 70 individuals to the Constitutional Convention, but a number of delegates did not attend. A total of 55 delegates attended the sessions of the Constitutional Convention sessions, but only 39 delegates actually signed the Constitution. The names of all the delegates, and the states they represented are detailed in the table below. The most famous delegates of the Constitutional Convention were George Washington, Benjamin Franklin, James Madison, Gouverneur Morris and Alexander Hamilton. Who was elected president of the Constitutional Convention? George Washington was elected president of the Constitutional Convention by a unanimous vote. 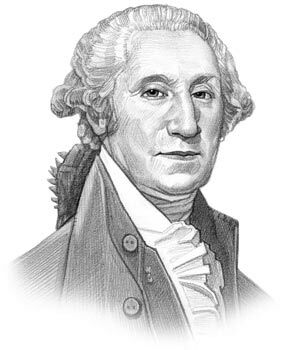 George Washington had returned to his home in Mount Vernon after the War of Independence but was persuaded to attend the Constitutional Convention by a stream of politicians. He held the respect of all of the delegates as the nation's war hero and was an obvious choice as President of the Constitutional Convention. His name was synonymous with the causes of liberty and independence. The Constitutional Conference was held to address the problems encountered in governing the country due to weaknesses in the Articles of Confederation. The Articles of Confederation had established the functions of the U.S. government after it declared independence from Great Britain. The document called the Articles of Confederation had effective since March 1, 1781 and was the basis of the new national government. The newly formed states had feared that a strong central government would create oppression and decrease the power of the people so the powers of the Federal (National) government had been deliberately limited. The state governments had the majority of the power. The national government lacked the power to collect taxes, regulate commerce or compel the states to pay their war debts. There was no national court system, no executive branch, no President and no effective way for the national government to communicate with the people. Before the start of the Constitutional Conference many attempts had been made to amend the Articles of Confederation in order to give Congress more power. However all of the attempts had failed to gain unanimous approval which was necessary because the consent of every state was required to amend the Articles. One state or another had objected to every amendment that had been proposed. The assembly gathered at the Constitutional Conference immediately discarded the idea of trying to amend the Articles of Confederation and set about drawing up a new scheme of government. George Washington, President of the Convention, made few speeches but his few words were very important and highly influential. The eldest delegate in the Convention was Benjamin Franklin who also was accorded great respect. Other delegates were experienced politicians, statesmen and business men. Many were lawyers and all of the delegates had considerable expertise in politics. All proceedings would be kept secret until the Constitutional Convention presented a finished Constitution. Some of the delegates to the Constitutional Convention had already begun to formulate ideas for a National Government. James Madison presented a Virginia Plan. The Virginia Plan was based on proportionate representation. Charles Pinckney brought forward a South Carolina plan. Pinckney's scheme was more detailed than was Madison's plan but both schemes provided for a government with "supreme legislative, executive, and judicial powers." Little attention was given to Pinckney's Plan as attention was focused on Madison's Plan which was well documented. On May 30, 1787 the Constitutional Convention voted that a "national government ought to be established, consisting of a supreme Legislative, Executive, and Judiciary." Refer to 3 Branches of Government. The Constitutional Convention next decided that the legislative department should consist of two houses. The delegates of the Constitutional Convention also devised a brilliant system characterized by an intricate system of Checks and Balances. However, when the delegates began to talk over the details, they began to disagree as to Representation in the two houses of Congress. The disagreements as to Representation led to more ideas for a National Government. In June Governor William Patterson brought forward the New Jersey Plan which he had drafted and been agreed by the delegates from the smaller sized states. But the New Jersey plan was also rejected. The Constitutional Convention reached a total stalemate over the issue of representation. The Constitutional Convention reached a complete deadlock over the thorny issue of representation. It required the opposing sides to make concessions enabling a breakthrough to the deadlock over representation for the convention to continue. Compromises were also required on the subjects of Apportionment and on Commerce and the Slave Trade. Connecticut delegates Oliver Ellsworth and Roger Sherman proposed a compromise, referred to as the Connecticut Compromise and then the Great Compromise, on the subject of Representation in the Senate and the House of Representatives. The compromise was that members of the House of Representatives should be apportioned among the states according to their population and should be elected directly by the people. In the Senate they proposed that each state, regardless of size, population, or wealth, should have two members. The Senators would be chosen by the state legislatures. It was agreed that the states should be equally represented in the Senate. Basically the compromise consisted of proportional representation in the lower house (House of Representatives) and equal representation of the states in the upper house (Senate). The delegates to the Constitutional Conference also found it difficult to reach an agreement as to the apportionment of representatives in the House. The question was should the members of the House of Representatives be distributed among the states according to population? The answer seems simple but the real question was, should slaves, who had no vote, be counted as a part of the population? It was finally agreed that the slaves should be counted at three-fifths of their real number. This rule was called the "federal ratio." The result of this rule was to give the Southern slave states representation in Congress out of all proportion to their voting population. The delegates to the Constitutional Conference then came into dispute over the Power of Congress over commerce. The Northerners wanted Congress to have power to regulate commerce. But the Southerners opposed it because they feared Congress would use this power to end to the slave trade. A compromise was reached by providing that Congress could not prohibit the slave-trade until 1808. What Compromises were made at the Constitutional Convention? These three major compromises made at the Constitutional Convention were crucial to the success of the Constitutional Convention and the new Constitution. On September 17, 1787, the Constitution of the United States of America was signed by 38 of the 41 delegates who were present at the conclusion of the Constitutional Convention (see table below for names of the signers of the Constitution). Although the Constitution document was signed by delegates at the Constitutional Convention the document would not become binding until it was ratified by nine of the 13 states (as dictated by Article VII). The names of all the delegates who attended the Constitutional Convention together with the states they represented are detailed in the table below. An asterisk * indicates the names of the delegates who did not sign the Constitution. The article on the Constitutional Convention of the Constitution provides the text, definition and history of one of the major achievements of his presidential term in office. The following video will give you additional important facts and dates about the political events experienced by the 1st American President whose presidency spanned from April 30, 1789 to March 4, 1797.